The Croydon team spent Saturday morning journeying from their concrete jungle into deepest, darkest (and greenest) Surrey to play bottom of the table Haslemere. After only fielding 11 players in the reverse fixture, the opposition had recruited and was better equipped this time with plenty of players on the field (and the bench). Croydon had also made changes with Big Willy trying his hand at match videography, Cousins testing out the wing and the prodigal son, Liam Bayford, returning at 9 after a two year exodus. Matt Dammers scores from a lineout. Croydon kicked off and were immediately on the front foot. With Griffiths and the Matthews brothers reliable as ever in the set piece, a 5 metre line out was driven over the line with Dammers turning Ministry of Defence into Mastery of Attack to touch down and claim the spoils. Quick offloads out of the tackle almost ends in a try. Croydon were in the ascendency, but not enough consistent play combined with too much shocking refereeing were preventing the Poppies from reaching their slick, graceful attacking potential and a couple of well worked moves finished agonisingly short of the try line. As a result, grace was thrown out the window in favour of brute force and the ferocious tackling from Shrimpton and Jeffrey was matched by crunching carries from Broadbent, Cousins and Lyell. Moved into the pack for the game, and sensing an opportunity to cut down Bond’s lead in the try standings, Lyell took the rest of the first half into his own hands. With Bayford reacting quickly to a 5-metre penalty, the ball was shipped to Lyell who crashed in to score. A couple of frustrating penalties let Haslemere chip away at the lead but, much like Adrian at a buffet, Lyell was quickly back for more and smashed through for a second. Half time score: 17-6. Frustration built in the second half both teams giving away unforced errors and penalties. The Poppies welcomed the return of Simons and his trademark handoffs while Bond tried to rally the team with some colossal kicks that travelled half way back to the Croydon as well as a monstrous bosh that could be heard from Croydon and left his tackler leaving the field thinking he was in Croydon. However repeated sloppy penalties allowed Haslemere to move up the field and gift them a try under the posts. With Haslemere smothering open play and Croydon still agonisingly short of a bonus point, it was on the shoulders of your humble narrator to kill the game off with the rugby equivalent of goal hanging. First scooping up a misthrown line out on the try line, then stealing the ball on the try line at the end of a vintage Simons run, a brace of zero-effort tries were awarded by the ref for the combined movement, with ball in hand, of half a metre. With time winding down, Drummey still saw an opportunity to stake a claim for the 2019 Drummey award and ran half way across the field before throwing a forward pass out of bounds which was deliciously captured by media officer Simons. 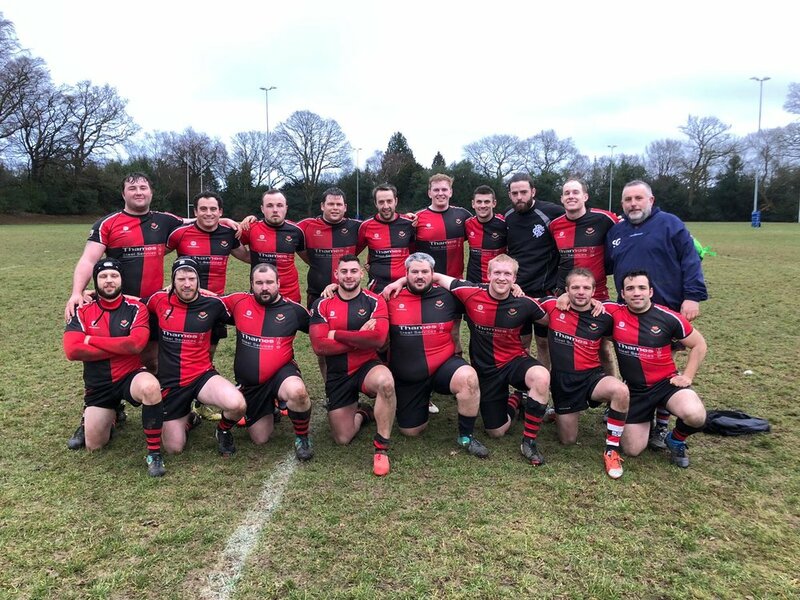 The final whistle blew and Croydon were pleased with much needed bonus point victory even if the performance did not reflect the team’s potential. Much like star players Shrimpton and Bayford having the cover their match pints with their socks before drinking, Croydon also made their tasks harder and less pleasant than they could have been.